Gypsies Journal: A very merry gypsy holiday indeed.... and a GIVEAWAY! A very merry gypsy holiday indeed.... and a GIVEAWAY! The arrival of our first holiday release EVER! But they are only available in very limited quantities so ORDER now before they're gone! 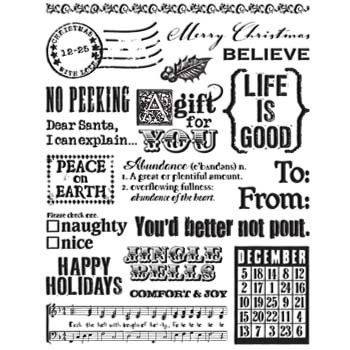 First, a very merry holiday clear stamp packed with 19 different holiday themed sentiments and gorgeous graphics. Ooh and Aaaah over the postage seal, musical notes, bingo card or use the To: and From: or ornate "A gift for you" to adorn your cards & gift tags. 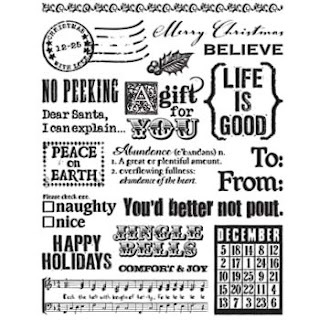 This stamp is packed with everything you need to spread some holiday cheer! 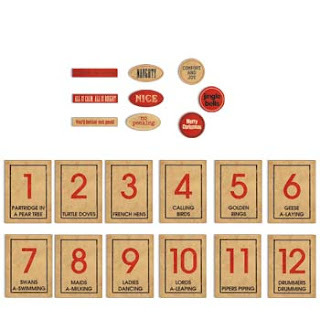 It's our NEW 12 days of Christmas ATC kit! This vintage~modern collection comes with 12 printed ATC cards and 9 printed diecuts... all on heavy manilla cardstock. Or simply string the 12 days of christmas cards on holiday ribbon for a funky hanging garland, clip the cards to your christmas tree, use them on holiday cards, there are endless ways to use all of the pieces in this kit to bring a little gypsy to your holiday! And the best part is we are giving away 3 sets of the holiday release! To enter, help us spread some early gypsy holiday cheer by posting any of the holiday product images on your blog or share this post on your facebook wall. Once you've spread the love, drop us a comment on the blog with a link and we'll draw 3 lucky winners that will each receive all 3 holiday goodies! We'll be posting photos of a 12 days of Christmas receipt holder project and the winners on Wednesday, November 3rd so check back and good luck gypsies! Great giveaway! I used facebook to spread the word. Love, love, love the Holiday collections!! I've shared this on facebook! W00t!! I just blogged it on my blog! I don't have many followers yet, but it's there! Great giveaway! I've shared it on my Facebook profile. I wanted to let you know these are great. I not to sure how to share being that I'm not good with a computer. But I love, love, love gypsy products. I posted to my facebook!!! Thank you so much for the chance to win! Left some love on my FB page! i would love to have my name drawn.. either way though i have to say i will be getting myself some of that wonderful paper!! hope to hear from you all soon!! I would love to be a winner!!! I shared your link on my blog. I've shared the love on Facebook! Oops, sorry. this time with the link. I posted on my facebook wall. Thank you for the chance. I love specially the stamps. I've got your tape on my sidebar! Believe me, people come for my candy links! Thanks for a chance to win some awesome goodies! I so love 7Gypsies products and the holiday pieces are no exception. Thanks for the opportunity to win. What a great giveaway!! Here is my link!! What a Fabulous day this has turned out to be!!! These Christmas products have just made my day :) I have posted all three goodies on my blog and my facebook!!!!! What an amazing bundle of goodies! Just posted on my Facebook. Love all of this new stuff...fabulous! I love the new products....I posted on Facebook! I shared on facebook. Thanks for the chance! looking forward to it all! 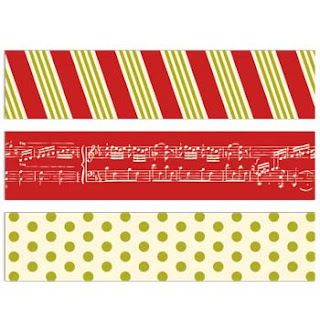 lurve lurve the paper tape - high on my wish list! oh I do love 7 gypsies myself :) and I have posted your blog on FB here's the link! I posted to fb as well. No blog but I loved me some Gypsies on FB. NanaBeth is my secret hero identity! Wow Jingle Bell Rock! I'm loving on the stamps and ATC's! I will post on my blog and can't wait to get my Gypsy on! woohooo!!!! I am loving EVERYTHING!!!! Posted on my blog! Love all the new stuff especially the tape! I have spread the Love through my Facebook Page love it all !! I love this stamp set, I just shared your giveaway on my blog! My mind is going into overdrive thinking of all the different projects I can use them on! Super fun! On my FB - love this new stuff! The stamp is unbelievable! I am a huge fun of yours and as I live in Greece I have to make special orders to get your staff. But it worths it! Love everything you guys have and do. My tray is here on my blog and I will post to FB, too, about the giveaway. Everything that's created with 7 gypsies' products looks fab! You're the best! Great giveaway. I posted on my facebook. Sent the work on Facebook. How wonderful! What a great set and I love them all. Would love to have the set. Thanks for offering us this chance to win. I posted and sure hope I win!!! Hope all my Facebook friends and followers jump on over. love this....posted link to my facebook page!!! posted it on my dirty laundry FB page. I shared on my FB Wall! Not sure you can see it though..
what a give away!!! I posted on FB....hope this link works!! I shared on facebook too!! I have posted pics on my blog as well as 'shared' the post on Facebook! The holiday collection is fabulous! It's getting me in the mood for the holidays....I can't wait! thank you for a chance to win! I posted a comment on Facebook!! Thanks for the chance to win those fabulous new products. ooooo yummy goodness..I would love a shot at it...I posted on my twitter, facebook, and blog..heres crossing my fingers and hoping I win!! Hope the mobile link works! So exciting. I posted the new in my Facebook. lovelies. shared the link via facebook. thanks so much. simply gorgeous....thanks for the chance to win..I posted to facebook! I don't have a blog or facebook --but would love to win some great products! I'm not on facebook or have a blog. May I still enter. this is a link to my wall. I love the new products & can't wait to see the great projects to come! I posted this to my blog. Great giveaway!!! I love it....also encouraged my frineds to look! Thanks ! I've shared this on my facebook as well as my blog!! wow, those stamps are a must have! Love the new release. i shouted out on facebook. Such a generous giveaway and this would just make my Christmas! Thank you for spreading the joy! OMG!!! What a fabulous give:O)away! I LOVE LOVE LOVE this new set and that new library drawer is THE BOMB!!! THanks for keeping on with the cutest projects ever!!! !